Getting a tattoo isn’t like getting a haircut – there are health and safety concerns to follow up on. Here at Sunset, we’ll explain to you exactly what to do when it comes to tattoo aftercare. Listen to your artist and follow these simple instructions after getting a tattoo, and not only will you be fine, but your tattoo will still look awesome years from now. · Leave your bandage on for at least a couple of hours after getting your tattoo. It’s there for a reason- to stop the bleeding and compact the wound, so leave it on. · And yes, it is a wound, so don’t get it infected!! Never touch it without cleaning your hands first, and clean it with soft, non-scented anti-bacterial soap, at least 3 times per day. · Keep it hydrated. This doesn’t mean splashing water on it when you wake up. For the first few days apply ointment. We recommend Protat aftercare cream. · For the first couple of weeks, try not to agitate the healing process by wearing tight clothes that will rub against your tattoo. If it’s on your back, learn to sleep on your front. · Avoid swimming pools, spas or hot tubs. Again, this is a great way to get an infection. Try to avoid any activity that make you sweat, and don’t expose your new tattoo to direct sunlight. · And last but not least, don’t pick at it! So there you go, stick to these basic rules and you’ll be fine. For long term care, always use sun screen (which you should be using anyway), and keep your tattoo moisturised. Sunset Tattoo are one of the most hygienic, respected and professional tattoo studios in Auckland. Contact us today to make a booking, or pop into the studio for a friendly chat. Our staff will be happy to answer any questions you may have about aftercare. Don't forget about our new tattoo supply website! If you’re searching online for tattoo supplies, then our new sister site, Tattoo Station is now up and running. Sunset Tattoo is excited to bring you great deals on high-quality tattoo products and equipment. After years of buying tattoo supplies at huge mark-ups from people who don't even tattoo, we became frustrated and decided to do it ourselves. This new range of products is for tattoo artists, by tattoo artists. We know the difference between quality tattoo equipment and the cheap, nasty stuff, and we make sure you don’t get the latter. Tattoo Aftercare is an essential part of the tattooing process, and we like to make sure it’s getting done right. From basic health reasons (don’t pick at it) to aesthetic reasons (moisturise to keep the colours bright), there are do’s and don’ts to follow once you get a tattoo. Follow them and everything should be fine. At Sunset, we suggest Protat Aftercare Cream. 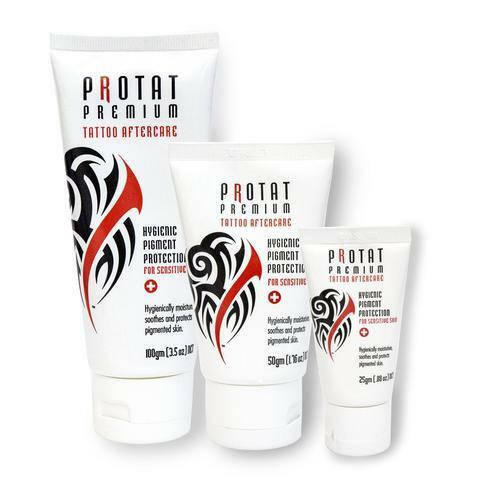 Protat are the world’s first tattoo aftercare company. By using chemists from their development team and overseas they are constantly researching new ingredients, with natural products receiving special attention. Each Protat product has been precisely formulated with highly experienced members of the tattoo and piercing profession. New developments by Protat can only benefit the industry and enhance respect for body art practitioners everywhere. Protat Premium After Care cream has been designed to be the primary product in the Protat range. It utilises the technology of the Soothing After Care Cream with the added ingredients. So there you have it, our new venture into the tattoo supply business. Please take a look at our new site, Tattoo Station, and if you have any questions about tattoo supplies for your studio, don’t hesitate to contact us. Sunset Tattoo are excited to announce our new range of tattoo supplies and aftercare products. Our new sister site, Tattoo Station is now up and running, bringing you great deals on high-quality tattoo products and equipment. Getting a tattoo isn’t as simple as walking in and out of the studio. There’s the research before concerning the design of course, but there’s also strict aftercare you need to adhere to. From basic health reasons (don’t pick at it) to aesthetic reasons (moisturise to keep the colours bright), you’ll have instructions to follow once you get a tattoo. Follow them and everything should be fine! At Sunset, we suggest Protat Aftercare Cream. Protat are the world’s first tattoo aftercare company. By using chemists from their development team and overseas they are constantly researching new ingredients, with natural products receiving special attention. Each Protat product has been precisely formulated with highly experienced members of the tattoo and piercing profession. New developments by Protat can only benefit the industry and enhance respect for body art practitioners everywhere. Protat Premium After Care cream has been designed to be the primary product in the Protat range. It utilises the technology of the Soothing After Care Cream with the added ingredients. Apply Protat Aftercare Cream (Protat Premium Cream for normal skin or Protat Soothing Cream for sensitive skin) Always wash your hands before applying cream or touching the tattoo. Evenly apply cream over the tattooed skin. Use only as much cream as the skin will absorb. Rub cream in gently as this will help stimulate the skin and bring blood flow to the area which helps in the body's natural healing process. DO NOT leave a thick film on the surface. Most people experience a mild tingling sensation after the first few applications, this is quite normal. After 10 minutes or so, clothing will not stick to the tattoo. Apply cream 2 to 3 times a day or as necessary to keep the tattoo slightly moist. DO NOT allow the skin to dry out. Wear clean clothes. Avoid close fitting clothes as they may absorb cream and dry the freshly tattooed skin. If you suffer from any allergies, seek advice from your GP and advise your body artist. Discontinue use of any product should irritation occur. Just remember, stick to these basic rules and you’ll be fine. We sell Protat Cream here in the studio, so make sure you leave with a bottle on your way out! For long term care, always use sun screen (which you should be using anyway), and keep your tattoo moisturised. The process of getting a tattoo doesn’t end when you walk out the door of our studio. There’s aftercare that need to be adhered to, both for health reasons and to get the most out of your new ink! Follow these simple instructions after getting a tattoo, and it will still look awesome years from now. At Sunset, we recommend using Protat Aftercare Cream. Protat are the world’s first tattoo aftercare company. By using chemists from their development team and overseas they are constantly researching new ingredients, with natural products receiving special attention. Each Protat product has been precisely formulated with highly experienced members of the tattoo and piercing profession. New developments by Protat can only benefit the industry and enhance respect for body art practitioners everywhere. Protat Premium After Care cream has been designed to be the primary product in the Protat range. It utilises the technology of the Soothing After Care Cream with the added ingredients. So there you go, stick to these basic rules and you’ll be fine. We sell Protat Cream here in the studio, so make sure you leave with a bottle on your way out! For long term care, always use sun screen (which you should be using anyway), and keep your tattoo moisturised.